Going back to the Yoga Tarot after a long break, I found myself pulling two cards that have somewhat different meanings in this deck than they would in a Rider-Waite deck: the Four of Pentacles and the Seven of Wands. In the Rider-Waite, the Four of Pentacles is about holding onto things or losing your own freedom to the desire to control. 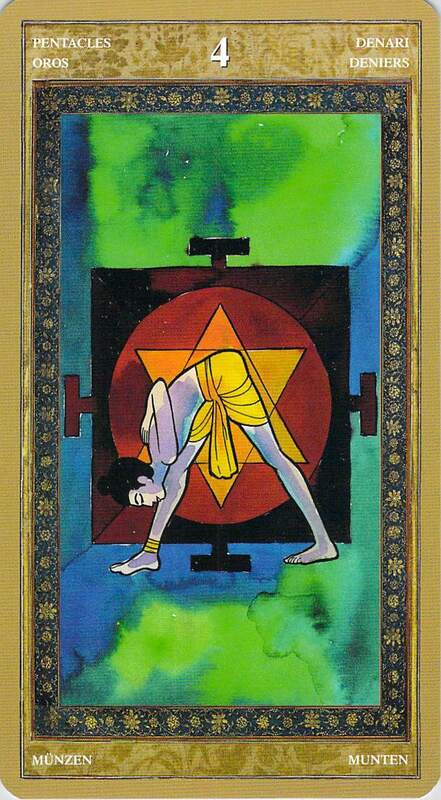 But in the Yoga Tarot, the Four of Pentacles shows pyramid pose, and is a card of building foundations. Perhaps the Yoga Tarot is showing us a more positive side to the Four of Pentacles, because building foundations is ultimately about controlling what comes next. What do these cards together tell us about the day ahead? Many things. 1. Our struggle today is to build foundations on which to move forward. Though it’s Friday and we might be yearning to start the weekend early, that would not be advisable — taking advantage of today’s energy can put us in a strong position from which to move forward in a balanced way. 2. Notice how the Four of Pentacles card looks as though it is superimposed on a background of the Earth itself, because of the blues (throat chakra) and greens (heart chakra) in this card. This tells us something basic about the nature of building foundations. Heart and voice should come together. Voice should speak words that come from the heart. In other words, we should go forward, together, which each other, in our relationships, from a place of speaking the heart’s truth. We can’t build our foundation on lies or secrecy. To go forward in a relationship, whether that relationship is a work relationship, a romantic relationship, a family relationship, a friendship, or any other relationship you might think of, that relationship will stall, probably for good, if it is based on lies and secrets. What gives us the strength to go forward together? Honesty and openness (Seven of Wands). 3. In life, we often mistakenly think that winning a struggle is about being strong and playing one’s cards right. No. And frankly, that belief will lead to lies when we think that the lies can somehow make our position stronger. You can have advantages and disadvantages in life. But winning the struggle is not about having the most advantages. It is about having the most open heart. 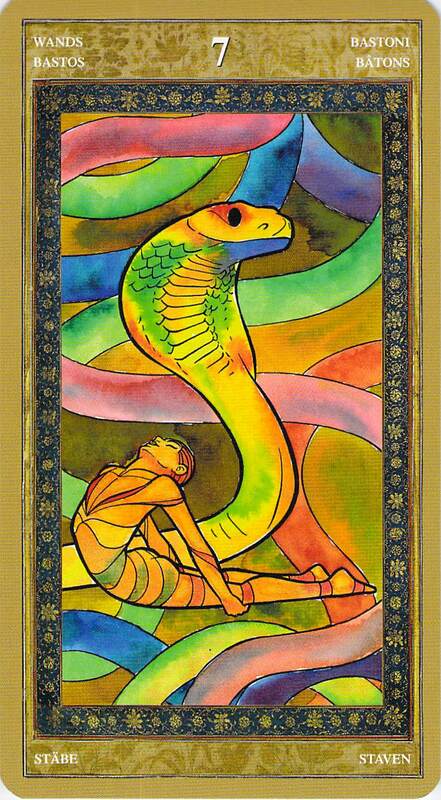 The Yoga Tarot’s Seven of Wands card tells us that how we do in the struggle is not about being a good fighter and beating other people down with a stick — rather, it’s about opening up, being flexible, allowing your back to bend as your heart rises to meet the challenge. Having an open heart means being guileless. It means not trying to manipulate. It means laying all your cards on the table, looking people in the eye, explaining yourself with earnest, honest sincerity. Do I need to say that the choice to do this takes courage? Yet the irony is that people who make a practice of doing this are often looked upon as weak and naive. Don’t mistake flexibility for weakness. 4. What does the Yoga Tarot’s comment that “Without a profound interior harmony, no technique has meaning” mean? Unless we build our foundation properly, on honesty and sincerity, nothing that we do later will mean what we want it to mean. Remember that old commercial from the 70s? “It’s not nice to fool Mother Nature.” Not only is it not nice, but it won’t work. Previous Cards for the Day: 4 of Cups/R’d Knave of Wands: Derailed by Dissociation. Mental Fog. Dreaminess. Wake Up!